DUNCAN, Okla. – This community of more than 23,000 is about to become a Cowboy Town. 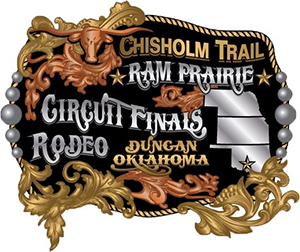 By hosting the Chisholm Trail Ram Prairie Circuit Finals Rodeo, Duncan is opening its doors to the greatest cowboys and cowgirls in the region to compete for some of the most sought-after titles in the Professional Rodeo Cowboys Association. The battle for the titles is set for 7:30 p.m. Thursday-Saturday at the Stephens County Arena in Duncan. That means most of the contestants come from the Oklahoma-Kansas-Nebraska region and have earned their way to Duncan by performing well at events primarily boundaries of those three states. This is their chance to shine in the bright spotlight that is the circuit finals. It’s true. For many, there’s a dream of leaving Duncan with the Prairie Circuit championship; for others, they hope to win the three-round average championship. In fact, the winners of those two titles in each event advance to the Ram National Circuit Finals Rodeo, where they will compete for ProRodeo’s national championship. That’s why Duncan is a vital stop for the top regional cowboys and cowgirls in the game. Whether they are part-time competitors or make their living on the rodeo trail, the circuit titles are valuable. The contestants battle all year with hopes of making the cut for the finale, and only the top players in the game advance. The circuit finals is not a typical rodeo. Not only do the top-caliber cowboys and cowgirls earn the right to be part of the competition, it also will feature amazing animal athletes. The top livestock from the circuit – both in timed events and with the bucking horses and bulls – are selected based on votes by the contestants. Harrison was recognized as the 2013 Coors Man in the Can for his work inside the barrel and is the two-time reigning PRCA Comedy Act of the Year. Now he’ll bring his award-winning talent to the folks in Duncan. “This is something we volunteer to do for our community,” Henderson said, noting that tickets for adults are $12 in advance, $15 at the door, while children ages 4-12 get in for $8; children 3 and younger are free. “We are a non-profit organization, and have given over $23,000 to the Stephens County Youth Shelter and the Cancer Center of Southwest Oklahoma. This is our fifth year of producing this championship, and we are excited about it.